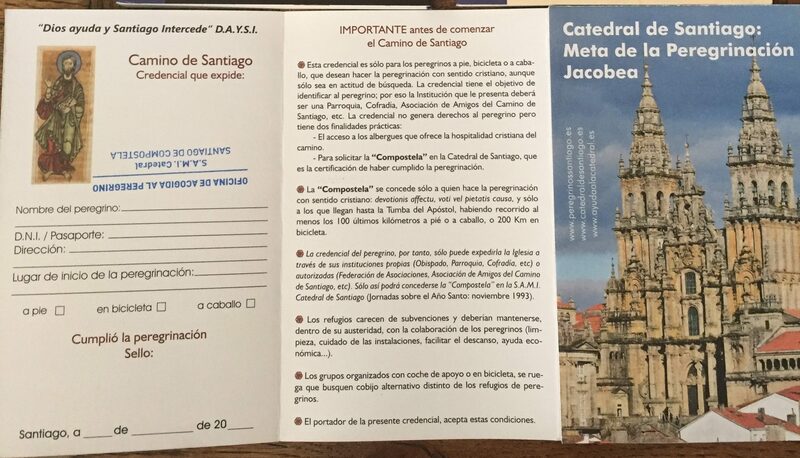 When registering at an albergue, pilgrims will be asked to present their credential to verify that they are walking or cycling the Camino. 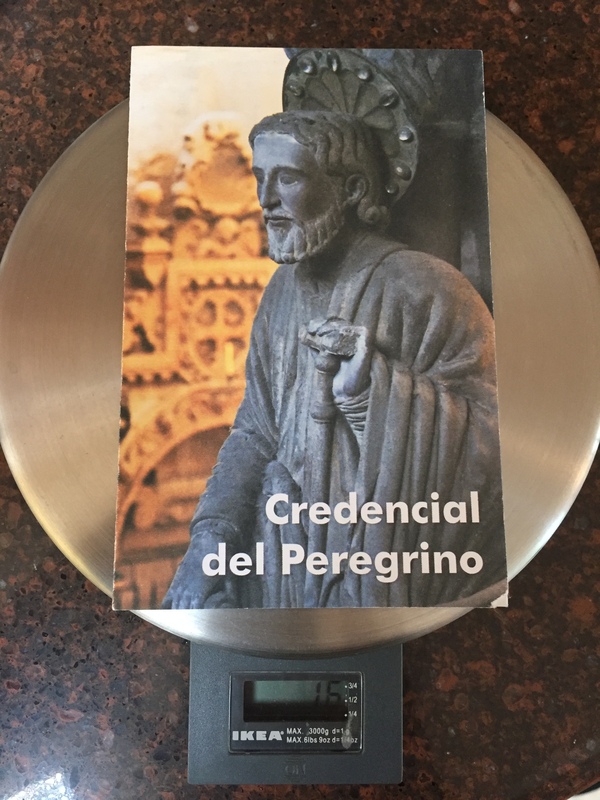 In addition, upon reaching Santiago de Compostela, at the Oficina de Acogida de Peregrinos (Pilgrims’ Welcome Office, Rúa Carretas, 33) pilgrims can present the stamped credential to confirm that they have walked at least the last 100 kilometers or cycled at least the last 200 kilometers, whereupon they are able to receive a Compostela, a document that certifies their pilgrimage. 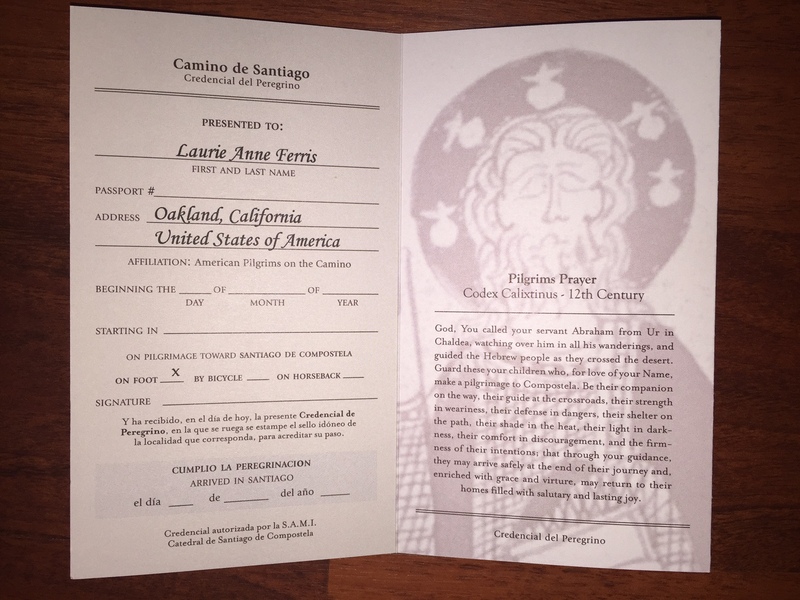 One can obtain a pilgrim credencial from numerous sources—including from American Pilgrims via this form—before you set out on the Camino or from sites actually on the Camino. 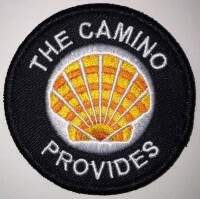 The Camino associations in a number of other countries also offer credentials. I requested my APOC credencial in February 2016 via their website. It comes with a letter that was updated on Jan. 31, 2016, so it has the new Pilgrim Office address in Santiago. 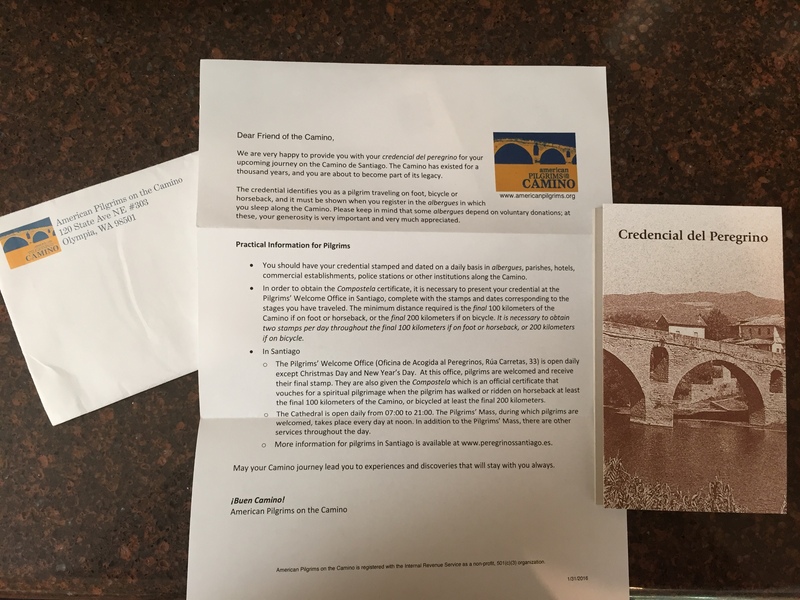 I received the Santiago credencial free when I ordered my Brierley Portugal guidebook from the Camino de Santiago Forum. 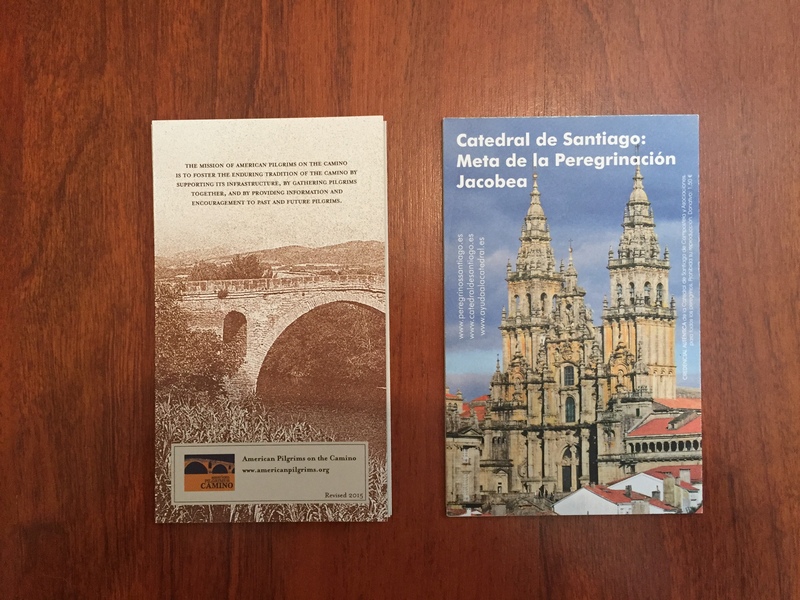 I was impressed that the Camino Forum Store had the 2016 Portugal guidebooks in Dec. 2015. Unfortunately their credencial has an upside-down stamp of the Pilgrim Office on the inside cover. Oops! It’s not a big deal, but you’d think someone would catch that one. The APOC credential inside cover has the pilgrim’s name and city, as shown below. Size difference: APOC 3 1/5″ wide x 6″ tall. Santiago 3 7/8″ wide x 6 1/8″ tall. The Santiago credencial (top) has 8 panels, APOC has 7. Santiago’s has one side with 6 panels, for a total of 48 squares for stamps. Notice the Fecha (Date) at the bottom of each square. APOC uses both sides for stamps, has 7 stamp panels, for a total of 56 squares for stamps. The Santiago version is definitely more colorful. It has four maps, whereas APOC’s has one map of Caminos in Europe. The APOC credential is on heavier card stock. Santiago’s is slightly thinner. I’ve heard some people like to get two APOC credencials and fill just one side of each with stamps. This way they can frame them and show all the stamps together. With the Santiago version, that wouldn’t be necessary as all the stamps are on one side. The credencial you go with is a personal choice. 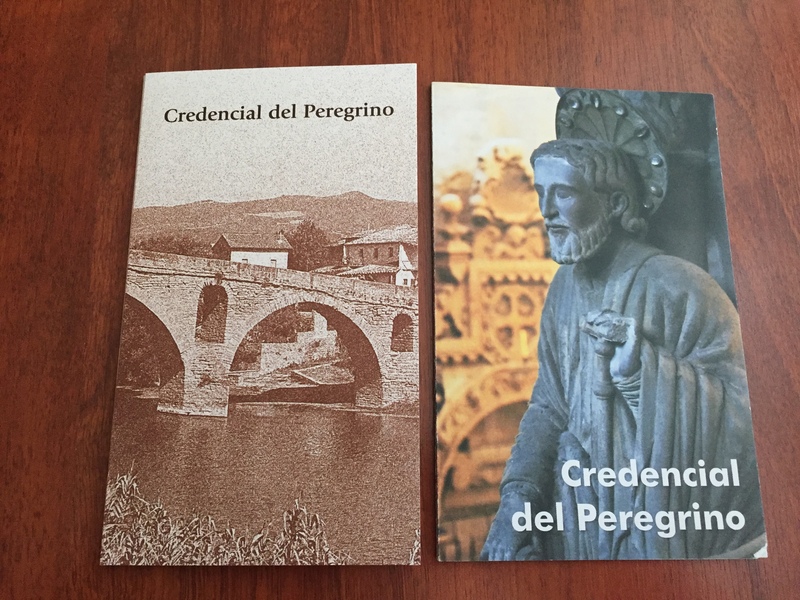 Any of them will get the job done and will serve as a meaningful souvenir of your Camino. I’m going to go with the personalized APOC credential and save that Santiago one with the upside-down stamp as a keepsake. It will be interesting to see how credencials evolve over the coming years. I do think the APOC credencial can use more color. It was just revised in 2015, so it will probably be a few years before they redesign it. But then again, with the increase in pilgrims during this Holy Year, APOC just might need to go back to the old drawing board! I leave you with a lovely reminder printed on one of the panels of the APOC credencial. Good thinking, Susan! I’ll treasure it more. 🙂 I wonder how many were stamped that way. If you are walking from SJPP or further, you will need more than one anyway. 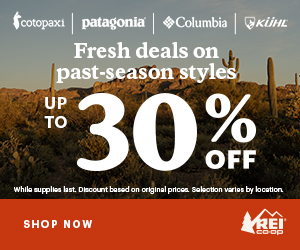 You can pick them up at major cities along the way when you get close to full. We started with the APOC. We got our second one at the Albergue del Monasterio de las Benedictinas in Leon. 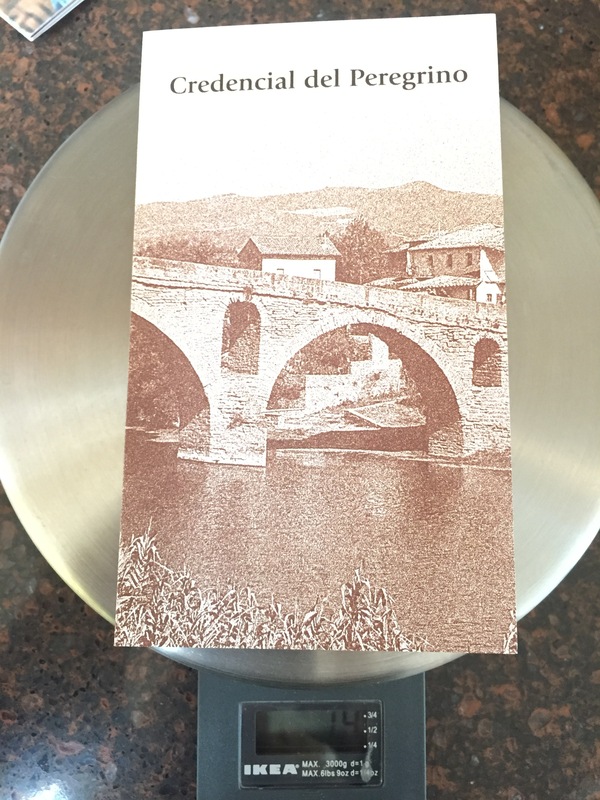 Neither of them look like mine, which I got at the Amigos del Camino in Bilbao, la capital del mundo. Interesting. Ooh, what does the Bilbao one look like? I’ll have to take a picture of it sometime. It’s like a mixture of the two but different at the same time.